Creamy Corn Dip for the Crock Pot - Warm and Addicting! 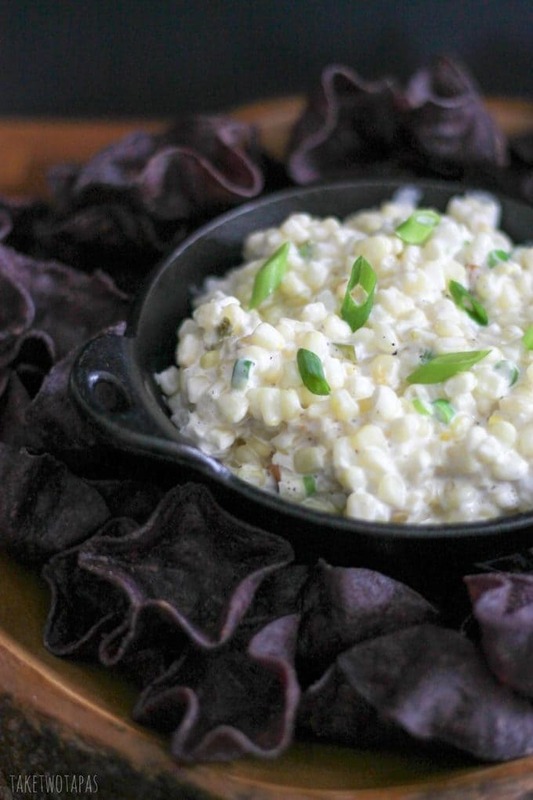 Creamy Corn Dip with a hint of jalapeño that you can make in your crockpot? Who doesn’t need this in their life?!? Welcome to Freaky Friday Spring Edition 2016! 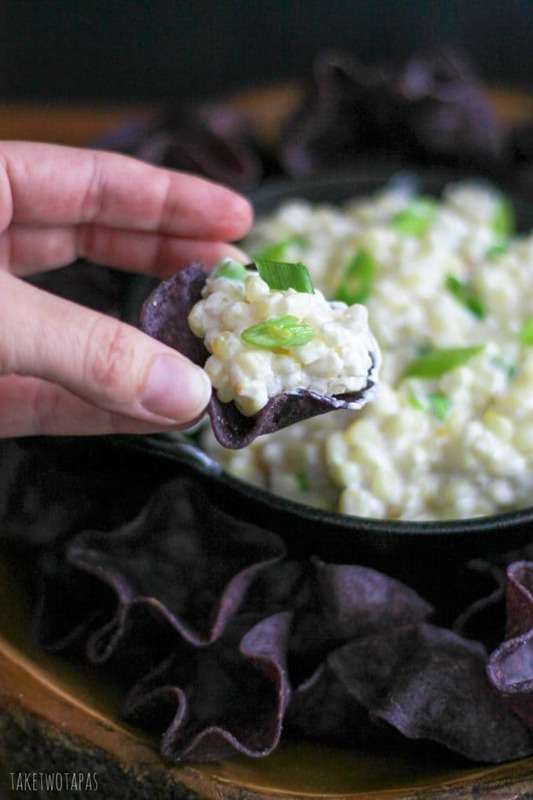 I am making creamy corn dip from Debi who is blogging great recipes and posts about a having a strong mind and healthy bodies over at Life Currents! Freaky Friday is a secret blog hop. Each participant is randomly assigned to another blogger in the group, we pick a recipe from their blog, and make it. I was so lucky to get Debi because she posts some great appetizer recipes. Right up my alley! Debi has been a vegetarian for over 20 years who recently started eating sustainable seafood too. You should read about her journey on her blog because it is very compelling. She loves healthy foods, canning, and food waste reduction. I could take a few lessons from her! If you are interested in a specific ingredient, she has an Ingredient Research Tab at the top of her blog. How convenient! Her reason for being a vegetarian is awesome! She also writes like me. Pen, pencil, paper. I have a ton of scribbled in notepads, journals, and a tiny book in my purse for when inspiration strikes me. And too many unfinished projects that made it to the computer and lie in wait… I think we are kindred spirits! She is definitely speaking my language with this creamy corn dip for sure! When looking for a recipe to make, I went straight for the appetizers. With so many to choose from, I had to narrow my search even more. Dips are where it’s at so I went there next and his amazing corn dip seemed to call to me on a deeper level. When I read that I made it in the crockpot, I was sold! This Creamy Corn Dip is perfect for a party, not your average chicken and cheese dip, and you can make it in a crockpot! Add your ingredients and walk away. This dip smells so good while it’s cooking that you are tempted to walk by and grab a spoonful. Do not do that as it is HOT! Trust me, I did it and my tongue is numb, but I did go back for another taste before putting the lid back on. A few other dips I like to eat before they cool down are my Spicy Arrabbiata Skillet Dip and my Frito Pie Skillet Dip. Super tasty and cooked and served in the same pan! After an hour, I went back to give it a stir and had another few bites… Quality control is the toughest part of being a food blogger! Once I get that done, I am going back and making Debi’s Grilled Red Pepper and Garlic Dip for my chicken kebabs and her Black Olive Tapenade with some puff pastry and brie bites! 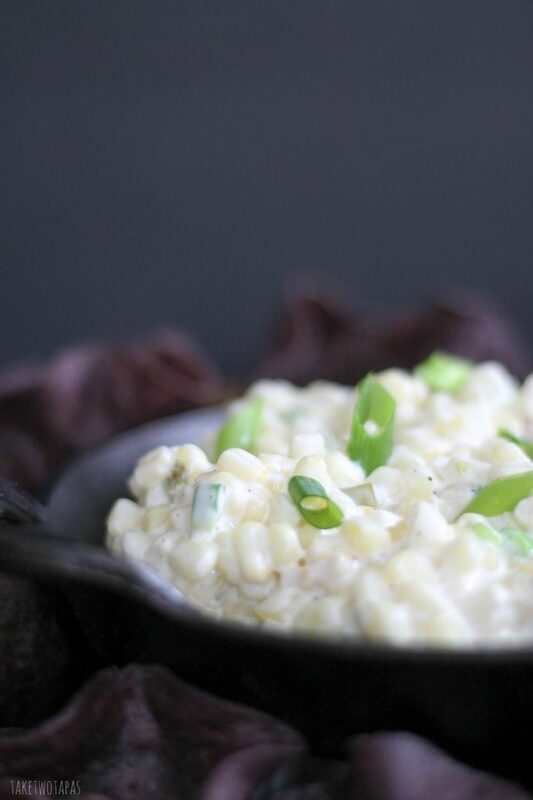 Creamy Corn Dip with a hint of jalapeno that you can make in your crock pot? Who doesn’t need this in their life, because I know that I do! Mix all the ingredient, minus the garnish in a crock pot. Stir and cook for another 30 minutes on high. Grab some ingredients and start making this dip pronto! While you are waiting for it to get finished, check out all the other bloggers that are participating in Freaky Friday and plan some menus for the week! Wow this looks and sounds delicious, I do need this in my life. Thanks for sharing! What a fun and easy dip! Seriously just dump and forget about it until your guest arrive but at the 1.5 hour mark.. LOL Creamy and delicious and spicy. I know that is would not last long with two hungry teenagers so I suggest a double batch. Sharing everywhere. Thanks so much for the feature on #saucysaturdays. You guys rock! Better make two batches. It goes fast! 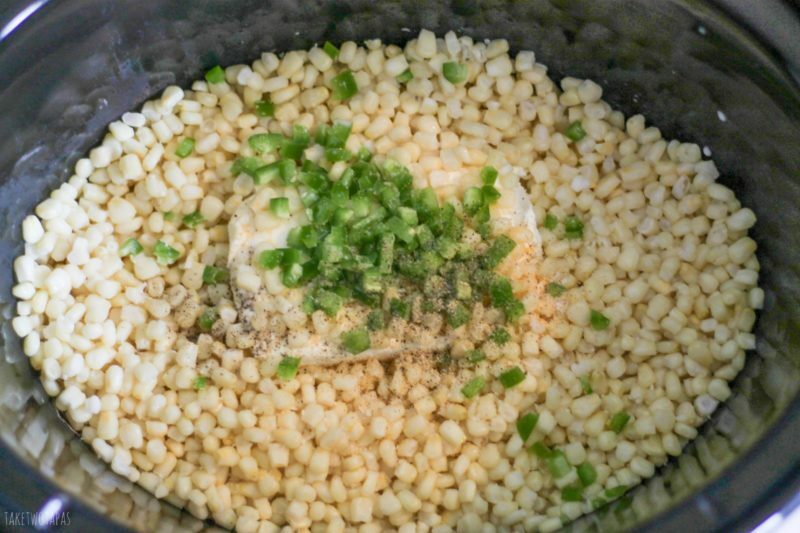 Instead of the garlic powder add a couple heaping teaspoons of Old Bay Seasoning ( or more to suit your taste!) I also throw in a lid or two of the juice from the pickled jalepenos! Oh my goodness yum! Oh my word! This looks amazing! I adore my crock pot and am always looking for more yummy crock pot recipes! Thanks! I might have to buy another one so I can make this more often! This dip looks phenomenal, cannot wait to try this soon! You will be totally hooked! I am totally putting this on my menu for our next party! This looks like the only appetizer I would ever want to eat! Yum! Thanks Ashlyn! Make sure you double up the recipe! This sounds so good! I will definitely be trying this recipe! I am never to be trusted in the presence of creamy corn dip, especially if there are also Frito Scoops lying in the nearby vicinity. It’s seriously dangerous. I love a slow cooker version, that is awesome! Perhaps a little toooo convenient, haha, but really genius! This looks super creamy delicious!! It’s going on the menu FO SHO! dips… my all time weakness! This looks amazing and I LOVE that it’s a mix and crockpot type of recipe! It has vegetables so its healthy!! What a yummy dip! Gotta have it, looks addictive! 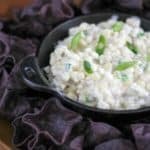 I have guests visiting this weekend, and this dip will be perfect to munch on! I might have to double the recipe though! Looks delicious! This looks absolutely amazing – Total bonus that it can be made in the crockpot! LOL – I had to giggle when you made that quality control comment. And I have scribbles everywhere too! I like to keep something to write with on me so if the mood strikes, I don’t forget what I was thinking about! 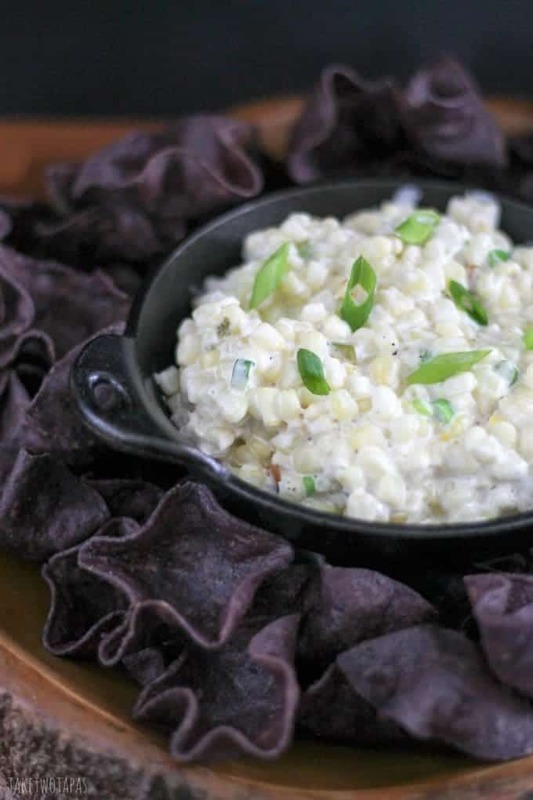 Anyway…this corn dip sounds fabulous and I love that it is made in the crockpot! I’m thinking it will be just about perfect for summer pool parties! This sounds so good! I love the ease of anything in the crock pot! I love things that cook themselves:) Now if the dishes could wash themselves too! What an interesting dip! I love the combination of corn and cheese, rather like the Mexican corn-on-the-cob I love so much. but now I can eat it with chips. I’m smiling as I reach for my crock pot. Like street corn in a bowl! WOW!! I don’t think this could be any easier and it sounds absolutely DELICIOUS!!! Cant wait to make this!! You will be making it all the time! Jennifer, I LOVE everything about this!! I am so thrilled that you joined our group, and I hope that you had fun! This dip looks amazing, and your photography is just stunning! Can’t wait to try this! Thanks Michaela! I loved doing it and reading all the other blogs and recipes! It is always neat to see someone else’s take on something that you made! Corn and cheese is such a magic combo! This would be a total hit at our next gathering. Love the addition of jalapeno too. Double up if there is a crowd! This looks so amazing, I can almost smell it! A perfect dip for any event for sure!